When her son Solomon graduated from high school, Terry McMillan was asked to be the guest speaker at the commencement ceremony. Determined not to be dull or redundant, Terry thought back to when she was stepping out into the world for the first time and the things she wished people had told her. Printing up what she thought were the most important tips for these new graduates, Terry was surprised to find that not only were these homemade pamphlets a hit with the students, but their parents clamored for copies too. Now with It's Ok If You're Clueless, Terry McMillan brings her trademark wit and sass to every son and daughter about to take their first tentative steps into adulthood. Offering such nuggets as "Sit up straight," "Don't listen to your parents," and "Bring your laundry home," as well as "See the world" and "Read anything and everything," It's Ok If You're Clueless is packed with the commonsense advice and conversational tone that have made her novels classic bestsellers. 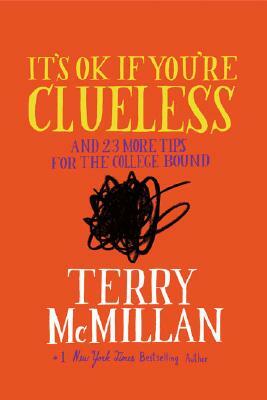 Equal parts witty and wise, It's Ok If You're Clueless is the perfect gift for the college bound this May. Terry McMillan is the critically acclaimed, award-winning author of five previous novels and recipient of the Essence Award for Excellence in Literature.